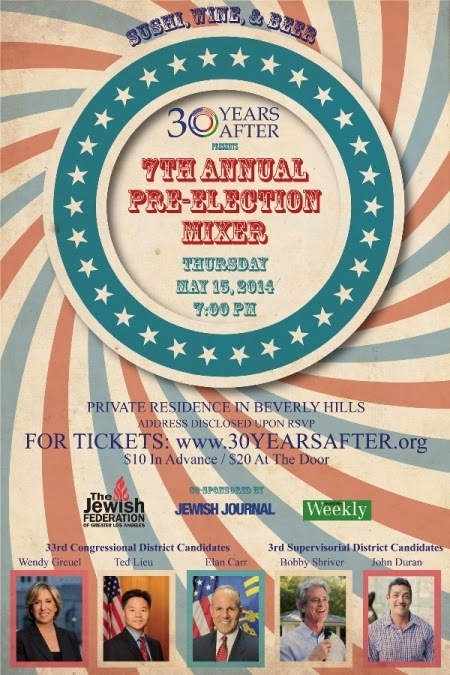 Candidates for both L.A.'s 3rd Supervisoral District and L.A.'s 33rd Congressional District, (to succeed the retiring congressman Rep. Henry Waxman) pitched 30 Years After at its 7th Annual Pre-Election Mixer on May 15th. The supervisoral candidates present were Bobby Shriver (former Santa Monica Mayor and City Council member) and John Duran (West Hollywood City Councilmember and former Mayor). The presenting congressional candidates: Elan Carr (deputy District Attorney prosecutor of gang-crimes), Wendy Greuel (former LA City Controller), Matt Miller (liberal radio host and author), and Ted Lieu (Calif. State Senator representing the city of Torrance). The other major candidate, Marianne Williamson, didn't attend. The primary election will be held on Tuesday, June 3rd. No particular party registration is required for you to vote for any candidate. The two candidates that receive the most votes will face each other in November. Polls close at 8pm. Click here to find your closest polling places. JooTube was on-scene to convey the candidates' views to the general public. Elan Carr for Congress: 'How my justice and Middle East orientation will benefit California and America:"
Wendy Greuel on the issues for L.A.'s 33rd District in Congress and her experience for Washington office. Calif. State Sen. Ted Lieu stumps on his Iran divestment legislation record. Political-office newcomer, Matt Miller, a center-left radio commentator explains his perspectives for reforming education and the GOP-dominated House of Representatives. Former City Controller, Wendy Greuel, conveys her affinity for Persian-Jewish issues for the June 3rd election. Why community leader, Dr. James Elist opened his home to invite L.A. political candidates to meet Persian-American Jews. Former Beverly Hills Mayor Jimmy Delshad discusses Persian-Jewish civic activism.